We all want our children to get along and to enjoy being with each other. I would take that one step further and say that I’d like them to develop life-long friendships and to be each other’s best friends throughout the childhood years. So what is our role in this process? Throwing them together and hoping for the best is unlikely to yield the outcome we are looking for, so some proactive parenting is necessary. Here are some specific steps we can take as parents to help siblings develop close relationships. Have a routine. Too much time together, particularly unstructured time, is a recipe for conflict. Nerves become frayed and patience short. Think about the time of day that siblings play together. If they are tired and hungry things are unlikely to go well. The length of time is important. Wind it up while everyone is still having fun. Finish on a positive note rather than waiting until play turns sour. Refer to them as best friends. Tell children regularly that they are each other’s best friends. Talk about how other friends will come and go but brothers and sisters will always be there for each other. Ask them if they are treating their sibling as a best friend should. Supervise sibling play times. If children are not getting along well then they should not be given the freedom of unsupervised play together. Mum or Dad need to be within earshot and ready to step in before a situation blows up into a conflict. If you can hear a problem brewing and fail to do something about it then you as a parent are partly responsible for it. There is a place when children are older to let conflict run it’s course and give them the opportunity to use the conflict resolution skills you are teaching them. If they are never tested or given the opportunity to do what is right, then they will not be able to grow in this area. Be wise with this though. Good modelling. Older children should be regularly reminded of their responsibility to be a good role-model. Even young children are a role-model if there is a younger sibling behind them or to friends outside of the immediate family. Teach children about good leadership; learning when to follow a good leader and when to be a good leader. Non-conflict training. The majority of your training should be in times of non-conflict, rather than in the heat of the moment. Take time to teach Godly character. Act out and work through common conflict scenarios. Role-play conflict resolution and negotiation skills. Teach specific phrases for dealing with conflicts the children are likely to face; turn- taking for example. Personality Types. Spend time teaching your children about the different personality types. Help them to identify their character strengths and weaknesses and to work on improving those weaknesses. Help them to understand each other better and relate with other’s needs in mind. Dominion. All children need to have personal dominion over something. Special toys that are theirs alone and that they are not required to share is an excellent way of allowing them to exercise this dominion. Toys that they are not prepared to share should as a general rule not be used during playtimes together. If a sibling wishes to use that particular toy they must ask first and respect the answer given. Memorise scriptures that relate to the conflicts they often face, such as “A gentle answer turns away wrath.” Ask children what God says about a particular behaviour? Make sure that children know the moral reason why. Read about sibling rivalry and its result in the bible. For example, Joseph and his brothers Gen 37 and Jacob & Esau Gen 25-27. No means no. Teach children to respect another person’s “no” or “stop.” From a very young age we teach our children to stay “Stop please” when they do not like the play that is going on. They are expected to listen and stop the first time they hear those words. This includes parents and applies to wrestling, tickling, chasing and any other fun game. Children soon learn not to say “Stop please”unless they mean it as our play immediately halts. We avoid just “no” or “don’t” because children often shout those in fun when it is clear they do want the tickling to continue. “Stop please” is not something they would normally say unless they actually mean it. Conflict resolution. Once a conflict between young children has occurred, walk through from the beginning and model the correct things to say. Ask older children what they should have said and then have them go ahead and say it. Require younger children to repeat the appropriate words after you. Give children specific strategies to address issues they face such as using a timer for turn-taking. Pow-wow time. Older children can be asked to sit together to talk through the problem calmly and quietly until they reach a compromise that both parties are happy with. Some time apart to calm down may be necessary first. There is to be no yelling, raised voices or unkind words. This works best when a parent steps in before a conflict has had a chance to escalate into something serious. The solution decided on should be bought before the parent to ensure it is fair and equitable, otherwise one child may always assume the “peacemaker” role by simply giving in to their more forceful sibling in order to get the problem sorted out and move on. That is not a fair and suitable compromise. Watch out for older children manipulating younger ones. Both parties should be satisfied with the solution. Justice and judgment. Teach children that if they are unable to resolve a conflict by themselves they should come to a parent. The idea that children need to just “work it out” is a faulty one. It leads to older, physically stronger or more dominant personality children always getting their own way and unpleasant character traits developing. “Might makes right” becomes the order of the day and good relationships will not be the result. When someone has been wronged, you as the judge should listen to both sides of the argument. Have one child speak at a time with a calm voice – no interrupting. If there are tears, whining or loss of emotional control in any way, they may need a few moments to sit alone and regain their self-control before bringing the matter before you. Children should be expected to have taken steps themselves to work out the problem before coming to you. Pray for wisdom. The children may be able to come up with a solution themselves or need you to supply one. When emotions are running high, it may work better to separate the children and hear one side of the story at a time without the other person participating initially. Sometimes this allows children to be more honest about their fault in the situation and what they need to do to make it right. Telling tales. The difference between tale-telling, tattling or dobbing and sincere reporting of a problem for mediation is all in the attitude. If damage to person or property will occur they should be able to come immediately. The first step is to encourage the other sibling in right behaviour. When the intent is clearly to get another sibling into trouble, rather than a sincere effort to solve the problem, the tale-teller receives the consequence that would otherwise have been given to the offending child. When children first come to you they should be asked whether they have tried to encourage their sibling to do right and also whether they have done all that they can to resolve the problem first. “What have you tried to make this right?” is a good start. Isolation. Children, especially older children, may need some time to work through the problems alone before coming back together to talk it through with the other party. Ask them to think through their responsibility in the situation, whether they have treated their sibling as a best friend and what God’s word has to say about it. Physical touch. Hugging or shaking hands when the matter is resolved melts the tension and helps to repair friendships. Verbal forgiveness needs to be asked for and given. Shaking hands afterwards often helps children to break through that last barrier of unresolved anger or hard feelings towards their sibling. While children can forgive someone without hugging or shaking, often this physical contact will get them smiling at each other again. Forgiveness and restitution. Saying “sorry” is for accidents, not for deliberate acts of unkindness. If the wrong was intentional then forgiveness is needed. Model this by asking for forgiveness yourself when you are in the wrong. Children are very forgiving and LOVE it when a parent apologizes and asks them for forgiveness. If something has been destroyed, taken or otherwise damaged, restitution or “paying back” must be made. A child who has knocked over another child’s tower can build it back up. A child who has drawn in a sister’s book can use their pocket-money to buy another one. Consequences. Clear consequences for wrong behaviour should be given and acted upon consistently. Some examples of consequences for unkind behaviour are acts of service, losing the opportunity to play together and saying 3 nice things about the other person’s character – not physical features. See spoiled walls. Reinforcement. Character reinforcement systems may be useful to jumpstart the process. Praise good behaviour and character when children do the right thing; catch them being good. Use specific praise that clearly labels what it is they are doing well. You may like to temporarily introduce a marble jar, praise plate, or treasure tree system. The sorting out prayer is useful for the wronged child to work through and helps them to forgive their sibling. Based on biblical instruction, it is something we will introduce as the children get older and have to deal with more weighty situations. “If… then…” charts are good for clear consequences. Take the time to write them up with the children’s help and refer to them when a problem occurs. I have linked to The Book Depository when products are available through them as that is the cheapest source for Australia in most cases. Other sources as stated. For general personality information and identification see Personality Plus by Florence Littauer. Personality Plus for Parents is by the same author with more information specifically for parents. Spirit Controlled Temperament is a Christian take on the 4 temperaments and how the Holy Spirit can help us overcome our inbuilt weaknesses and improve our strengths. Making Brothers and Sisters Best Friends is a good tool for teens to read through either by themselves or with you, with time to discuss each chapter together. Proverbs for parenting is an excellent resources for finding what the bible has to say about parenting related topics with Proverbs sorted into easy to reference categories. The Power of True Success How to build character in your life. 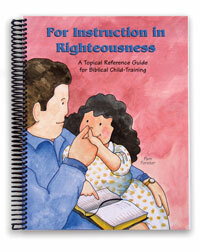 A good resource for the Christian family for teaching character to children. 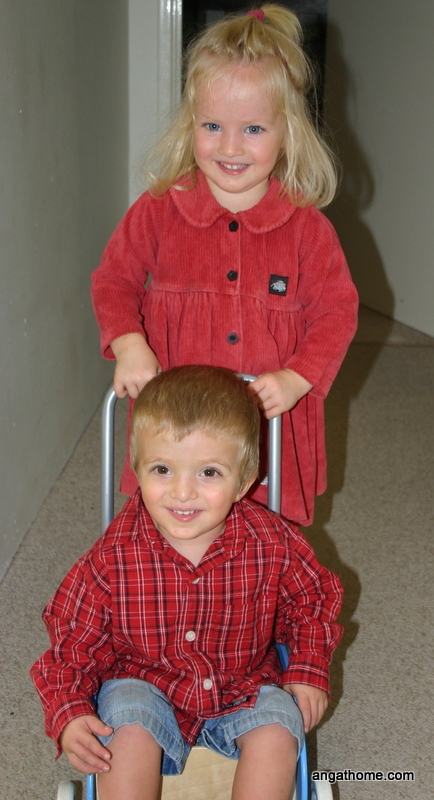 Dealing with sibling conflict by Joey & Carla Link is a topic from the Moms Notes. These are an excellent resource for all things parenting. Very detailed with ideas for all ages. Brilliant but it is pricey. Audio CDs also available. 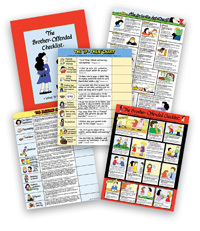 The Brother offended checklist and booklet and If..Then Chart are helpful in the thick of dealing with conflict. Great to take children straight to to help work through their conflicts with a biblical framework. Available separately or in a set at Heart and Home and Doorposts.